Are you a Mickey fans? If yes, you will be awed by an impressive 20ft Mickey sculpture. Don’t miss the 1,000 Mickey Figurine Christmas Tree, a tree unlike any other and a first in Asia – featuring 6-inch figurines created by Malaysians from all walks of life. Disney Mickey 90th Anniversary and Dream Christmas @ Pavilion KL! Be sure to check out the 100 Go Local Curated Mickey Figurine Showcase of Mickeys creatively decorated by luxury and lifestyle tenants of the mall. Outdoors, the Disney fun doesn’t end! Immerse in a wintry wonderland in the Disney Frozen Show Globe for beautiful pictures with the characters. Don’t miss the Huawei ‘Snowy Christmas’ experience every night at 8pm until 25 December 2018 at the Main Entrance. The Pavilion Dream Express, a fun train ride will raise funds for charity, and back by popular demand. Launching the event was Guest of Honour YB Tuan Haji Khalid Bin Abd. Samad, Minister of Federal Territories accompanied by Dato’ Joyce Yap, CEO (Retail) of Pavilion Kuala Lumpur and Tan Wee, Head of Retail & Licensing, The Walt Disney Company Malaysia & Singapore. 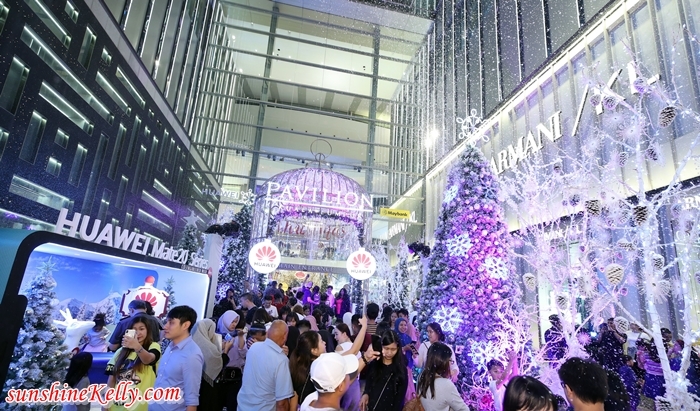 Guests comprising the media, partners, tenants and friends of Pavilion KL were treated to a fantastic evening of sound, light and dance.